Serving my kids a hot breakfast during the school week is really important to me. 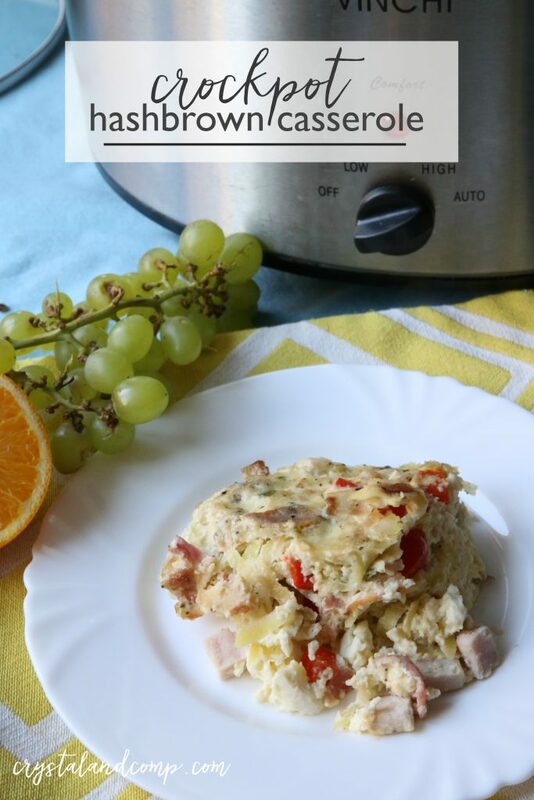 Here is a favorite breakfast recipe that is really simple to pull together and cooks in the slow cooker. 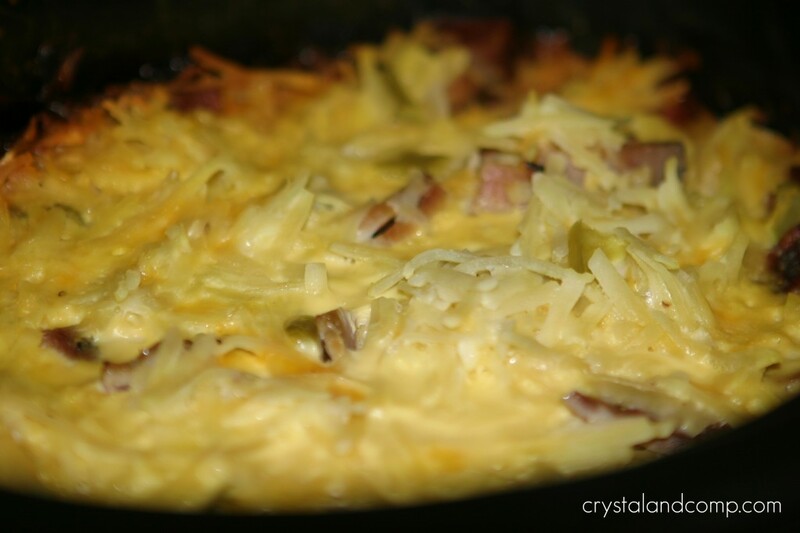 Have you ever made Crockpot Hashbrown Casserole? It’s amazing! It is perfect to prepare the night before. Then breakfast is ready when everyone gets up the next morning or you can use it as a dinner idea too! 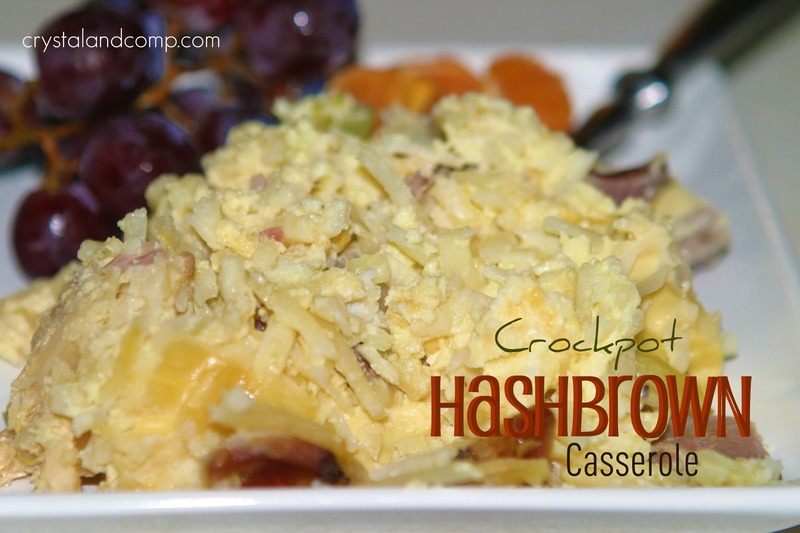 This crockpot hashbrown casserole is a real crowd pleaser! You can use a combination of meats or stick to just one. Mix together your eggs and milk (and salt and pepper if you’re using it). Dice up the onion and bell pepper. Evenly add the frozen hashbrowns to your crockpot. Pour the egg mixture over top. 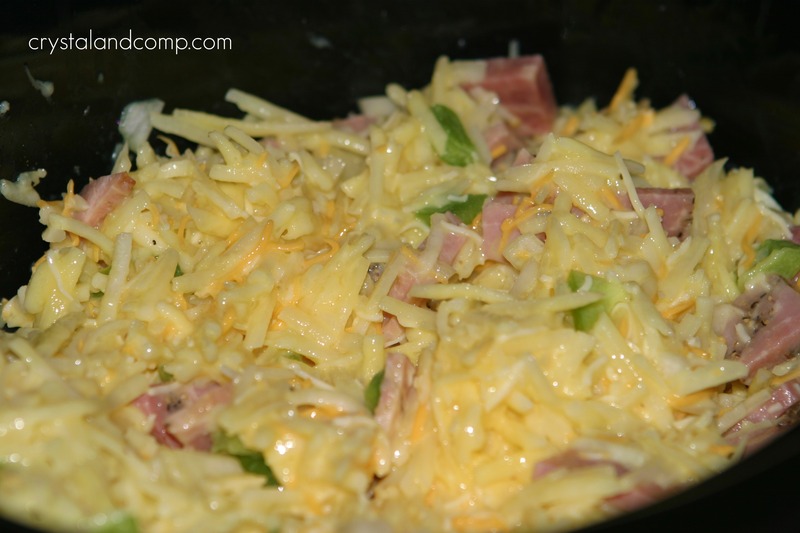 Add the ham, veggies and cheese. Here I used ham, bacon and red bell peppers. Here I just used ham and green bell peppers. This is how it will look when it’s done. And your house will smell like breakfast. Plate it up and serve by itself or add some fruits to the side. My guys love grapes and orange slices. This breakfast is perfect for a busy school morning. Looking for ways to use up your Easter ham? 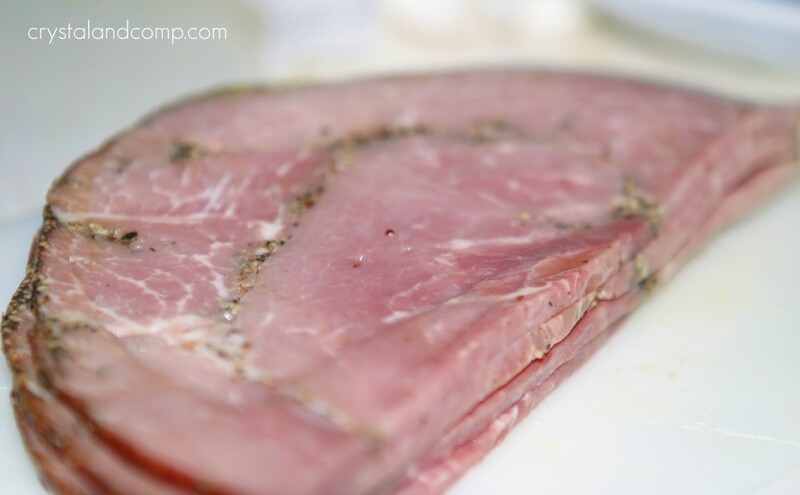 Here are 20 easy ham recipes to keep handy after Easter. This recipe makes a lot, so you can store the leftovers in the fridge and have breakfast for the entire week. Crockpot Hashbrown Casserole came from once of my favorite crockpot websites- A Year of Slow Cooking. Mix together your eggs and milk (and salt and pepper if you're using it). Plate it up and serve by itself or add some fruits to the side. My guys love grapes and orange slices. You can find @PetitJeanMeats on Twitter and follow the hashtag #TxBacon for more delicious Texas-sized recipe ideas. Looks wonderful! 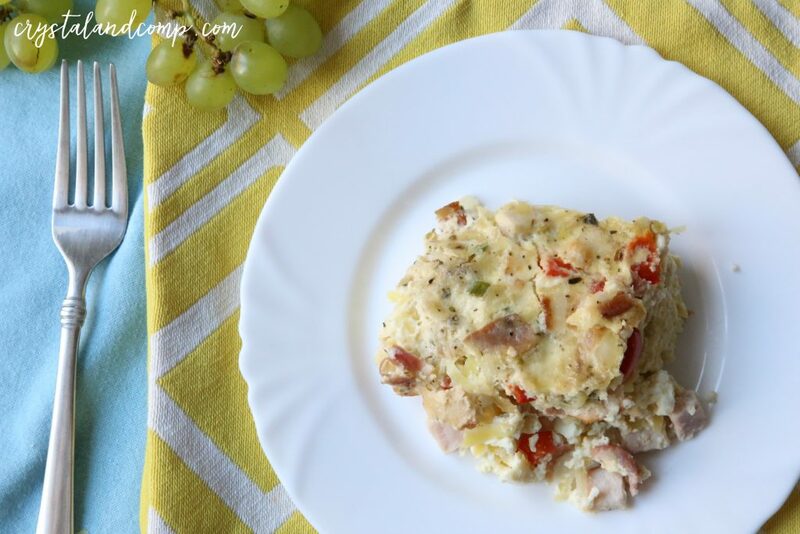 breakfast in the crockpot would be perfect! That looks wonderful. Cannot wait to try it out. Wow this looks great, seems like you could make some serious alterations to it as well for diversity. Maybe even use the left-overs as breakfast burrito filling…fill, wrap, flash freeze, wrap individuals, bag them all up and freeze for grab and go. Perfect solution for my family since the adults are up an hour before the kids. Excellent suggestions, Mechelle. Thanks so much for taking the time to share. What a simple and easy breakfast idea – I’ll be saving this one. Thanks so much for sharing it. Looks delicious than you for sharing. I make something similar for my B&B guests. I use pepper jack cheese instead of cheddar to kick it up a bit. 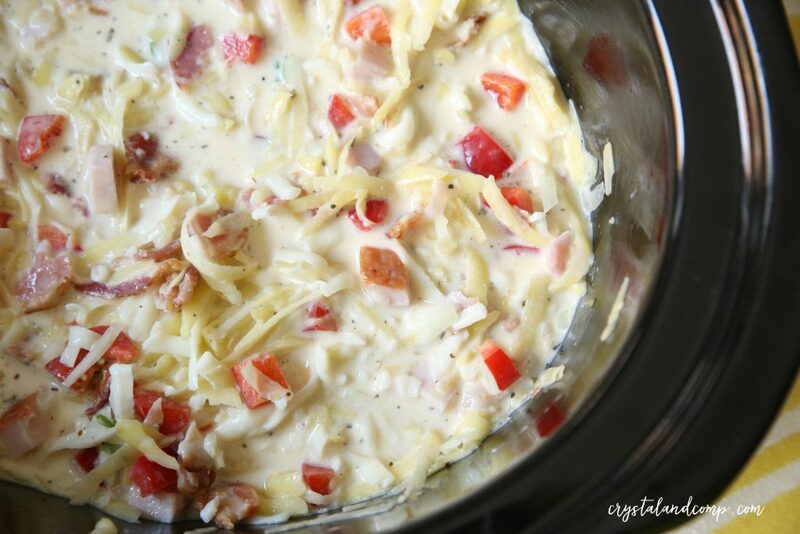 I just love that this recipe goes in the Crock Pot, I would love waking up to this ready for breakfast! Hope you are having a great week end and thank you so much for sharing with Full Plate Thursday. Crystal, this recipe looks great! I think I will be making it for either my MOPS group at church our the ladies bible study this week! Thank you! Sounds awesome Lisa. I hope everyone loves it. What a wonderful thing to wake-up to. I am loving the ease of this recipe and that you used a slow cooker!! I can’t wait to try this for when my family is over. That sounds delicious. Looks like a good recipe for my 4th of July company! It’s a good excuse to go buy a new crock pot with a timer!!! Carolyn recently posted..Sure wish I could grow something green. YUM! Always looking for a good crockpot recipe! Love that you can do this overnight. Amanda- I have an index of other easy recipes here: https://www.crystalandcomp.com/easy-recipes/. How yummy! I made something like this the other day, just for myself. And I love your idea to use the crock pot. So convenient! Thanks for linking up with me for Friday Favorites! Please come back and link up again this week! Yay breakfast in a crokcpot! I so need this for my Mom’s group brunches! And I just added this same recipe widget to my own site and I love that you can print it right from the blog. Looks great! MMMMMM this looks delish and so easy! 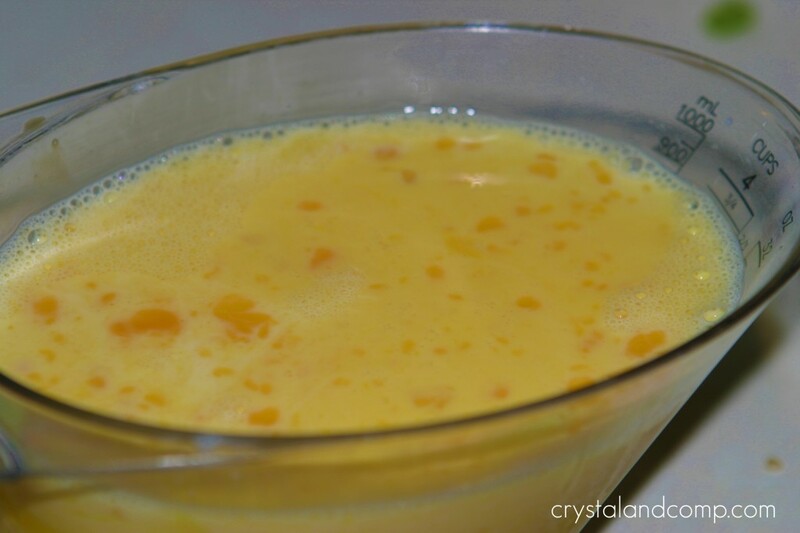 This recipe will be great for our first day of MOPS (Mother of Preschoolers). I am the hostess and always trying to find great new breakfast dishes. Thanks for sharing and linking to Tempt My Tummy. I love how all the breakfast ingredients are in one dish! Yum, thanks for sharing! Enjoy your new Red Plate, your recipe is featured on Full Plate Thursday this week. Have a great day and come back soon!